Approx 160 tons of steelwork and 1700 m2 of roof cladding. This structure has a curved roof with an aluminium standing seam roof system. These panels are over 30m in length and were formed on site. These panels provide an unblemished finish as it has no visible fixings across the expanse of the roof. This finish also minimises roof maintenance long term. 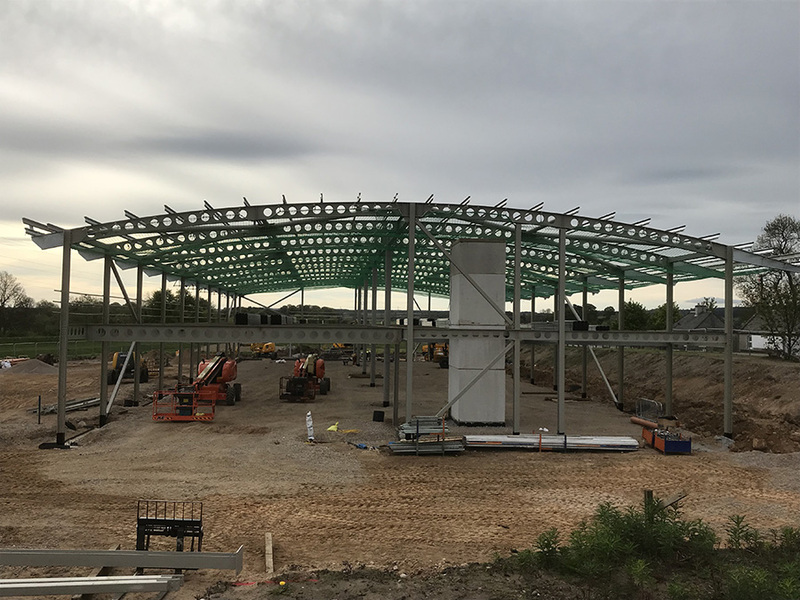 Cellform beam sections were used in this structure to reduce the overall tonnage of steel, providing a cost efficiency. The use of cellform beams also enables easy access for internal services to be fitted with no additional height requirements. An additional cosmetic feature to the exterior of the building is the inclusion of Glulam Cigarette Columns that were sourced from Austria and fitted by Simmers Contracts.